Netik Phurba or Heart Essence of Vajrakilaya (Tib. གནད་ཏིག་ཕུར་བ་, Wyl. gnad tig phur ba), also known as the Nyengyü Phurba or Oral Transmission Vajrakilaya (Tib. སྙན་བརྒྱུད་ཕུར་བ་, Wyl. 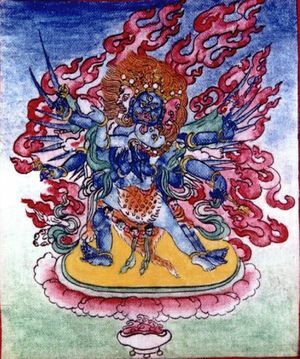 snyan brgyud phur ba), is a Vajrakilaya practice which Jamyang Khyentse Wangpo received through oral transmission (nyen gyü), one of the seven authoritative transmissions. When Jamyang Khyentse Wangpo was staying at the Dzongshö Palace of the Sugatas, one of the five places of enlightened qualities, he had a profound experience of realisation. Then he found himself in the Shitavana charnel ground by the Shankarakuta stupa in the presence of the nine great vidyadharas, the recipients of the Kagyé. Guru Shakya Sengé transmitted to him the instruction of this Heart Essence of Vajrakilaya, according to what Prabhahasti had transmitted to him. Jamyang Khyentse Chökyi Lodrö wrote some arrangements for the practice cycle while still in Tibet. However the texts were not taken to India and unavailable at the time, and so Dilgo Khyentse Rinpoche also made arrangements for the revelation. At a later time, the arrangements of Jamyang Khyentse Chökyi Lodrö were found again and published. In 2018, Orgyen Tobgyal Rinpoche asked Dakpo Tulku Rinpoche to compile a framework for a great accomplishment practice (Tib. drupkok). Preliminary practice for the Heart Essence of Vajrakīlaya, from the Heart Essence of the Activity Vajrakīlaya, by Jamyang Khyentse Wangpo (phur pa'i gnad tig sngon 'gro - phrin las phur pa'i gnad tig). English translation: translated by Gyurme Avertin. English translation: Great Clouds of Nectar: Invoking the Blessings of Vajrakilaya, by Gyurme Avertin. English translation: Essential Daily Practice Text for the Quintessential Kilaya of the Oral Lineage, translated by Gyurme Avertin. English translation: A Celebration of Enlightened Activities, translated by Gyurme Avertin. English translation: Victory over Māra, The Fulfillment for the Hearing Lineage Kīlaya, translated by Nālandā translation committee. English translation: Quick Accomplishment of Buddha Activity: An Abridged Four-Karmas Fire Offering For the Quintessential Pith Kīlaya of the Hearing Lineage, translated by Nālandā translation committee. English translation: Opening Up the Accomplishment of Enlightened Activities, translated by Gyurme Avertin. English translation: Prodigious Display of Activities, translated by Gyurme Avertin. English translation: The Illuminating Blaze Wisdom Self-empowerment Ritual for the Quintessential Kilaya, A Profound Instruction From the Oral Lineage, translated by Gyurme Avertin. This page was last edited on 10 August 2018, at 08:01.